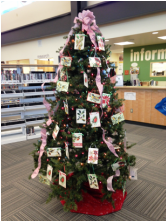 Every winter during the holiday season, the Seward Community Library Association's volunteers decorate a tree located upstairs in the library. Its ornaments are special and aren't your typical edible candy canes or glass baubles. Rather, these ornaments contain the names of books that library staff have prepared based on their recommendations and patron requests. For $20, library patrons can select which titles they would like to sponsor. ALL Wish Tree money that's collected goes directly to this program. Watch for this special tree this holiday season! More information about how to access the photo collections of the Seward Community Library Association. Recycle your books with the Friends Used Book Sale! Annual book sale in April. We welcome used books, DVD's and more, however, there are some items we do NOT accept. See our Guide for used book giving below! Help us put books into children's hands. We are seeking gently used or outgrown books for our 'Free Children's Books' display. Just drop them off at the library desk or into the Used Book Box. Used children's books are finding welcome new homes with school children in distant Alaska villages/towns where often there are no school libraries or community libraries. We call this mission Books for the Bush and over 300 lbs of used books have been mailed to teachers requesting books for their students. ﻿﻿ This is a great Volunteer opportunity! ﻿﻿﻿This amazing video uses first-person accounts to tell the story of exactly how the 1964 earthquake occurred in Seward. Simply put, it is a MUST SEE for every visitor and local alike! This digitized DVD is shown at the National Park Visitors Center in the small boat harbor daily at 11:30 am. It is also available for private viewings by contacting the Friends at 907-362-1225. SCLA has a special art and photo collection that was handed down from persons involved in the early founding of the Seward Library. These collections are of historic interest and are being taken care of by the association so they can be preserved and past on to our next generations of Seward community members. Many of our art pieces are currently on display in the entry hall of the Library Museum or inside the museum itself. We are always looking for volunteer that have and interest in or experience with collections of our type.